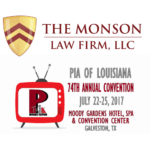 The Monson Law Firm attended the Professional Insurance Agents of Lousiana’s Channel Surfing Exhibit Hall in Galveston, Texas at the Moody Gardens Convention Center. 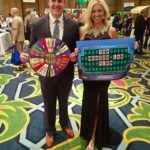 Pictured are Vanna White (Ann’Lee Earles with The Monson Law Firm) and Pat Sajak (Graham Inman with Edward Jones Investments). Click here to view pictures! Our Marketing Director Ann’Lee Earles, CISR, CPIA attended the UPC Insurance reception at the PIA Convention in Galveston, Texas. 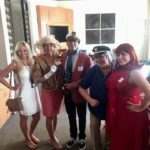 Pictured is the UPC team dressed as Gilligan’s Island Cast: Eva and John Forney, Margaret Miller and Shay Robinson! Click here to view pictures! Louisiana Comp. Blog interviewed Matthew D. Monson, Esq. for its July 12, 2017 article regarding the recent Louisiana Supreme Court decision of Clavier v. Coburn Supply. At issue in Clavier was whether an employer is responsible for paying for a Functional Capacity Evaluation (“FCE”) performed by a medical provider chosen by the worker. Mr. Monson, agreeing with the Supreme Court, was quoted in the article that “employers aren’t responsible for funding the prosecution of the claim.” To read the article, click here. To see a copy of the decision, click here. We are looking forward to seeing you at the PIA of Louisiana Convention in Galveston, Texas this weekend! Remember, The Monson Law Firm is the KEY to all of your legal needs. Click here to view pictures! 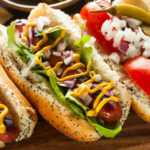 Happy National Hot Dog Day from The Monson Law Firm! Happy National Hot Dog Day from The Monson Law Firm! Whether they are grilled, boiled, broiled, pan-fried, rotisserie cooked, cooked on a stick over a campfire or any other way, hot dogs are a favorite summertime staple. They are loved by children and adults alike plain or garnished with one or a combination of mustard, ketchup, onions, mayonnaise, relish, cheese, bacon, chili, or sauerkraut. What’s your favorite hot dog combo? Click here to view pictures! 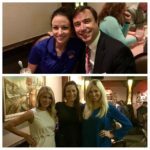 The Monson Law Firm attended the New Orleans Chapter of Professional Insurance Agent’s July lunch meeting at Impastato’s in Metairie. We enjoyed hearing President and CEO of the New Orleans Tourism Marketing Corporation and Stadium Announcer for the New Orleans Saints, Mark Romig, speak about all the upcoming plans for NOLA tourism this coming year! Pictured are Alicia Stanley with Markel and Matthew Monson, Esq. Pictured below are Rachel Salter with Southern Fidelity Insurance, Allison Salter with AFCO and Ann’Lee Earles, CISR, CPIA with The Monson Law Firm. Click here to view pictures! 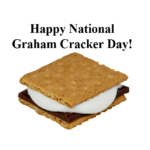 The Monson Law Firm is celebrating National Graham Cracker Day! The graham cracker was originally invented as a “health food” as part of the “Graham Diet”. Developed by Presbyterian minister, Sylvester Graham in the early 1800s, graham crackers were originally made from whole-wheat graham flour with added bran and wheat germs. The minister believed this snack would curb a variety of sinful cravings. Modern graham crackers are made with bleached white flour and come in a variety of flavors including honey, cinnamon and chocolate. While a delicious snack on their own, they are also terrific ingredients for desserts. Crushed graham crackers blended with butter and pressed into pie tins or springform pans make excellent crusts when lightly toasted. One of the most popular treats made with graham crackers is the S’more. What’s your favorite dessert to make with Graham Crackers? Click here to view pictures! 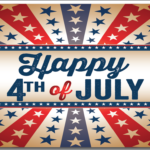 “We hold these truths to be self-evident, that all men are created equal, that they are endowed by their Creator with certain unalienable Rights, that among these are Life, Liberty and the pursuit of Happiness.” The Monson Law Firm would like to wish everyone a Happy 4th of July! Click here to view pictures!